How Old Does Your Resume Make You Look? They say that age is just a number, but the sad truth is that there is a lot of ageism going on in the employment market today. People who appear “too old” on their resumes are often passed over because employers stereotype them as overly-experienced for the job. Likewise, if you appear “too young” on your resume then you run the risk of being dismissed as inexperienced and in need of training to get the job done. Employers aren’t technically allowed to discriminate based on age, of course, but they can infer your age from your resume and make the decision not to contact you. That’s why it is so important to update your resume in order to appear ageless. It is possible that you are an older job applicant seeking work in a competitive industry today. You have a lot to bring to the table but you may get stereotyped as “too old”. An employer may fear that you are too experienced for the job and will be bored, that you’ll expect a higher rate of pay than they want to offer or that you aren’t up to date with Web 2.0 and current technology. You want your resume to alleviate these fears by emphasizing your experience and de-emphasizing your age. Including irrelevant experience. Since you do have a lot of job experience, you can pick and choose to include only those experiences that are truly relevant to the position for which you are applying. Including dated experience. Even if you have forty years of relevant experience, it’s not necessary to include positions that you held twenty years ago. 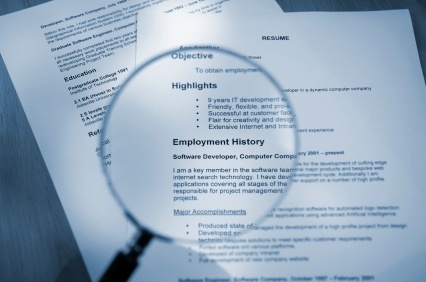 Emphasize your most recent experience on your resume. Including an objective. This isn’t common on most professional resumes anymore, so it can make you look outdated. You also don’t want to include “references available on request” for the same reason. Reference any up-to-date technology experience that you have. Include it in your skills and/or responsibilities. Create a web 2.0 resume. This includes a slideshow resume, a resume hosted online or a video resume. Close the employment gap. If you have an employment gap on your resume then try to close it by including other relevant experience (such as volunteerism) that you engaged in during that time. Perhaps you fall entirely at the other end of the age spectrum. You are fresh out of college and looking for your first professional job. The problem is that if you look “too young” on your resume then employers may assume that you are inexperienced and even flaky. They don’t want to invest time and money in training you if you’re going to just jump to another job, so they may overlook your resume when hiring. You want to use your resume to strongly emphasize the experience that you do have, your best skills and your commitment to the tasks you take on. Including months on your dates. This makes it look like you don’t stick around long anywhere. Just include years. Separating your unpaid work from your paid work. They should both go under work experience. Don’t include a separate volunteer section. Failure to write a summary statement. This is a paragraph at the top of the resume that explains what your experience is. It’s the place to brag about yourself and to say what you have to offer. Don’t exclude it. List positions you’ve held for a long time. For example, if you held a leadership position in a church then list that. Look at templates for less traditional resume formats. For example, a functional resume is sometimes used in place of the standard chronological resume to emphasize skills over experience. Include a letter of reference. Get someone you’ve worked for in the past to write a good reference letter for you and include a copy of it along with your cover letter and resume. Don’t give employers a chance to be ageist by showing them your age on your resume! Thanks so much for posting. I have struggled with being ‘young’ on my resume. Some employers have in the past failed to believe my resume, thinking that I am too young to have held some of the roles I have had. I’ve found that in some circumstances I have had to change my job titles to make my resume more ‘believable’ for my age (i.e. changing ‘Manager’ to ‘Executive’ or ‘Executive’ to ‘Assistant’). I’ll definitely be taking on board your recommendations to avoid having to do this in the future. Thanks so much! An excellent article Kathryn. Your point about not mentioning irrelevant experience is a very good one. I would also add to this not to include outdated studies. As an example, included in my accounting degree was one unit information systems and the teaching language was Fortran. I enjoyed it and was very proud of my high score but any mention of Fortran in my resume now would have me looking nothing short of ancient. Also, I think both young and old potential employees should have a profile on LinkedIn. Thank you for some wonderful tips. Competition is tough out there and every little bit helps! @Elizabeth Todd and @Jenna … Thanks so much for your additional tips. Very useful!